You have the life every rabbit can only dream of. a family who really loves you and feeds you well. 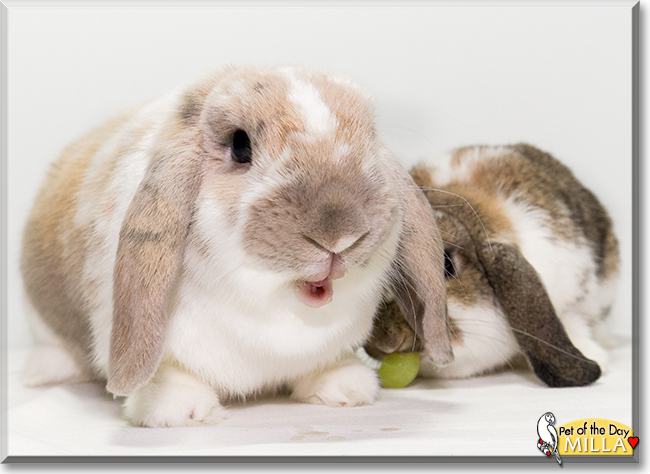 Dearest Milla, what a beautiful Mini Lop Rabbit you are! You have such pretty fur that looks so soft and the sweetest face with those lovely big eyes. You are adorable in those great photos.. holding the flower in the first one, then that larger-than-life closeup of your nose and mouth, then as the Crown Princess you are, and finally with your dear little sister Stella behind you. You and she are living the charmed lives of House Rabbits, with people who know how to take care of you properly. You are very sweet and friendly and social, and you are also quite good at rabbit jumping! You and Stella and your dear people all love each other very much, don't you. What a wonderful love-filled home you share! Congratulations, darling Milla, on being chosen today's Pet of the Day! We hope you and your dear people and Stella and all your family and friends are enjoying a fine celebration, full of fun and lovies and all your favorite games and treats, maybe some special carrot tops, parsley, and broccoli! Hi Milla in Sweden! Happy Pet of the Day to you, sweetheart, and to your lovely fur sister Stella, too! What beautiful bunnnies you are, one most precious pair, and to say you are bunny super models would be an understatement! You two sure know how to pose for the camera, and doesn't the camera love you! Major props to your talented photographer/human for capturing you in all of your bunny glory! How wonderful that you two kids get free roam of the house, 24/7! Even with the home bunny proofed (as much as possible), it takes one (make that two!) very well behaved bunnies to be allowed free range! hehe Oh, how very lucky your human is, having two such gorgeous, well mannered, sweet and loving furkids in you two girls! You truly are a treasure, Milla (Stella too! ), beautiful inside and out, simply the best! Thanks for the BIG smiles, Milla! Meeting you and Stella today, seeing your beautiful photos, has been a real treat! I hope you're enjoying a very special day and night of celebration...playing to your heart's content and munching on yummy treats, cuddling with your human, being loved and pampered to pieces! Lots of love, snuggles and kisses to you, precious Milla, our very special and most deserving Pet of the Day, EVERY day! Love to lovely sister Stella, too! Milla, What beautiful bunnies you and Stella are. How nice that you both get free run of the house. Hello, bunnies Milla and little sister Stella! 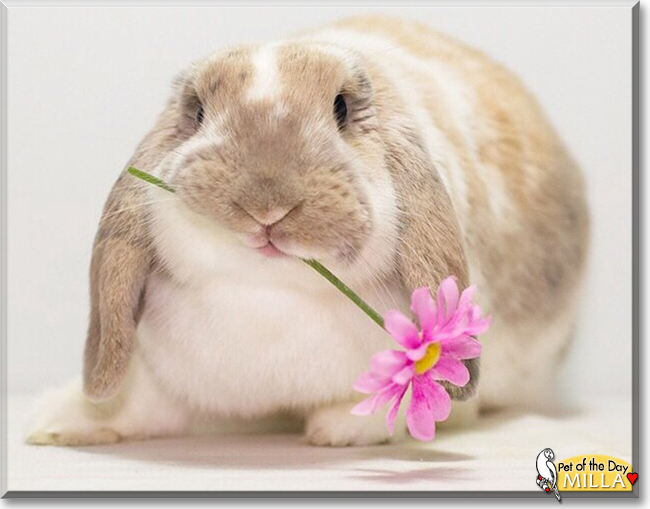 Happy Bunny Pets of the Day! What beautiful ladies you are! I like your soft fur and your cute lop ears! The camera definitely likes you, sweeties! You are free-range bunnies, and you have the run of the house! You are sweet, friendly and social! You are much loved bunnies! Happy, happy Pets of the Day!